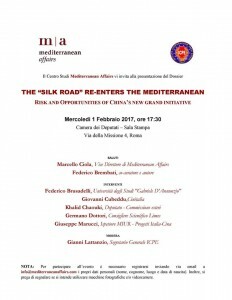 Mediterranean Affairs is pleased to invite you to the dossier launch The “Silk Road” re-enters the Mediterranean: Risk and Opportunities of China’s new grand initiative. The event will be held on Wednesday, the 1st of February, starting at 5.30 p.m., at the Press-room of the Italian Chamber of Deputies. The event is organized by Mediterranean Affairs with the Foreign Countries Cooperation Institute (Istituto per la Cooperazione con i Paesi Esteri – ICPE). The theme of the dossier concerns the opportunities and risks of China in the Mediterranean region, which in last decades is becoming a laboratory where we outline the various shades of the globalization. Marcello Ciola (Mediterranean Affairs), Federico Brembati (co-editor and author), Federico Brusadelli (“G. d’Annunzio” University of Chieti-Pescara), Giovanni Cubeddu (Cinitalia), Khalid Chaouki (Deputy), Germano Dottori (Member of the Editorial Board at Limes), Giuseppe Marucci (Ministry of Education, Universities and Research), and Gianni Lattanzio (ICPE) will present the topic and discuss it with the audience. NOTE: registration is mandatory for all participants. You can book a place by contacting us, specifying your personal data (name, surname, date and place of birth): info@mediterraneanaffairs.com.